Freedom's Lighthouse: New Poll Shows WA Democrat Sen. Patty Murray Trailing Potential GOP Opponent by 10-Points! 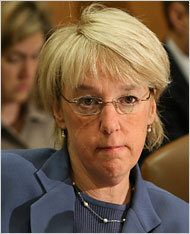 New Poll Shows WA Democrat Sen. Patty Murray Trailing Potential GOP Opponent by 10-Points! A new Survey USA poll out of Washington shows incumbent Democrat Sen. Patty Murray trailing prospective GOP Senate Candidate Dino Rossi by 10-points, 52%-42%! This coming week is likely to be decision week for Dino Rossi, still mulling a race against Sen. Patty Murray. A few straws in the wind suggest Rossi will declare for the race. I sure hope Rossi runs, defeating Murray and replacing her with a conservative would be a huge victory for those who want sane government.